Skin moles are extremely common and generally benign growths that can occur anywhere on the body. They can be flat or protruding and range in color from flesh colored to brown or black. Almost everyone has at least one mole, though some people develop more than others. In some cases moles are present at birth, in others they develop after birth and usually before age 30. They are almost never a cause for concern, unless they suddenly start to exhibit changes in size, color or symmetry. If an existing mole begins to show signs of changing, you should have it examined by a doctor as it could be becoming cancerous. What causes moles to develop? Scientifically speaking, moles are collections of skin cells called melanocytes that grow together in a clump rather than spreading out over the surface of the skin. No one knows why we get moles or why some people get more of them than others. The number any of us develop depends on our genes. 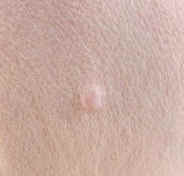 Skin moles sometimes appear in “crops,” especially during the early teens, but can also occur individually. Pregnancy can cause moles to get bigger, but if one is getting bigger faster than the others, you should have it checked by your doctor. How do you get rid of skin moles? Most moles are harmless and safe to ignore, but if you would like to try a natural product to remove them, Heal Moles is an option that may be effective. to leave a flat mole, but the color generally stays the same. Complete destruction of a skin mole requires removing the full thickness of skin. The resulting scar may be more noticeable than the mole was, which is why most doctors will recommend leaving non-medically threatening moles alone. Moles sometimes grow annoying coarse hair and it may be safely removed by shaving or plucking. Permanent removal of the hair, which has roots deep within the skin, requires electrolysis or complete surgical excision of the mole. A mole that bleeds, itches, markedly changes color, has an unusual appearance, or changes in any way should be checked by your doctor immediately. Dermatologists have developed what is commonly referred to as the “ABCDE” method for determining whether changes to a mole are a cause for concern. This method examines certain specific characteristics of a mole to determine its severity. These include asymmetry, or a difference in the shape of the two halves; border irregularities including ragged shape or blurriness; color changes throughout the surface of the mole; diameter that is greater than that of a pencil eraser and evolution, or changes in size, shape or color. If a mole begins to exhibit any of these characteristics, it could potentially be cancerous. If you notice that any of your body’s skin moles look different than they once did, visit your dermatologist’s office to make sure they are not developing into something more serious. Make it a point to do regular self-examinations so you can notice any changes in their appearance.